Strategically end your hike poolside, and await the cannonball splashes. Whether "it" happens to be a killer backhand or fierce serve, round up a worthy opponent and hit the courts. Equally ideal for morning coffee or evening cocktails, the balcony is like an escape from your escape. Comfortably furnished living spaces make the perfect mountain getaway. Raining? Or worse, blizzard-ing? The indoor pool makes a great Plan B. Appoint salad-tossers and table-setters so you can focus on the entree. It's an easy five-minute shuttle ride to the slopes at Keystone Ski Resort. A swim in the heated outdoor pool is a perfect pre-dinner activity. You won't have to go far to work on your golf game, River Course at Keystone is only a four-minute drive away. Tucked in among thousands of trees, the Tennis Townhomes, Quicksilver and Saint John’s complexes are home to a range of vacation residences sized to accommodate a variety of friend-groups and families. 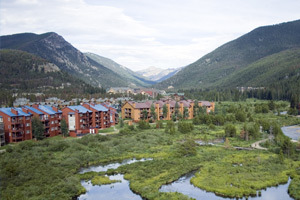 Choose from studios to four-bedroom retreats from 600 to 1,700 square feet in size. Ski storage is a plus, saving your shins from “Who left that there? !” mishaps. Individually decorated residences have full kitchens spacious enough for Team Dinner to get the job done (with Team Cleanup reporting for duty shortly thereafter). And the gas fireplace in the living area invites your crew to gather for a marathon Uno game or Crazy Eights around the coffee table. If you visit during the summer months, rent canoes, kayaks or paddle boards on Keystone Lake, just a mile away, or go see a show at Lake Dillon Theatre Company. The snowy winter months are perfect for skiing, snowboarding, snowshoeing, cross-country skiing, snowmobiling and more. And when Keystone Lake freezes, it becomes the world’s largest Zamboni-maintained ice rink (five acres! ), complete with built-in hockey rinks and rental skates. Bundle up and attempt a slap shot, or join the figure skaters in the middle for a double axel, depending on your skill set.